growth in Canada and support good paying jobs for Canadians. 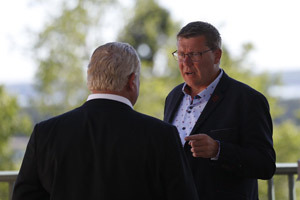 Premiers noted the importance of expanding trade as a key factor in growing Canada’s economy and emphasized the need to promote Canada’s trade opportunities in growing international markets such as China. Premiers welcome the Prime Minister’s commitment to explore a potential free trade agreement with China. Provinces and territories are working to expand trade links with China and other growing economies in Asia. Canada’s Premiers have led trade missions to China in 2008, 2011 and 2014 and will continue to work to strengthen trade and cultural ties between Canada and China. 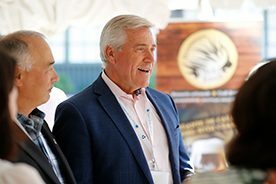 Building on recent successful international trade negotiations, Premiers call on the Prime Minister to ensure that once negotiations commence, provinces and territories are active participants in negotiating the new trade arrangements with China. 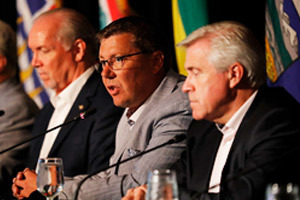 Premiers discussed environmental assessment, in light of recent federal Expert Panel reports. Canada’s world-class environmental protection laws and review processes must continue to balance the need for responsible resource development and a sustainable environment. Premiers called on the federal government to work with provinces and territories to ensure that environmental review processes respect the principle of one-project, one-assessment, do not add unnecessary duplication or delays in the responsible development of Canada’s natural resources, continue to have access to the best available expertise, including through the National Energy Board, and that any changes respect provincial and territorial jurisdiction, and existing co-management regimes. Changes to the federal process must ensure regulatory certainty and timely decisions while providing transparency and meaningful participation. Premiers discussed the ongoing implementation of the Canadian Energy Strategy (CES), released in July 2015. The CES is a flexible framework for provinces and territories to realize a common vision for Canada’s energy future. It supports sustainable energy development while also ensuring a globally competitive energy sector. 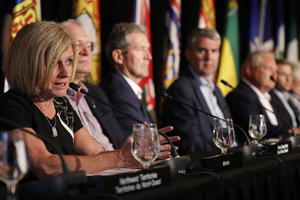 At last summer’s meeting, Premiers directed Ministers to continue collaborative work across the four priority areas including energy efficiency, delivering energy to people, climate change and the transition to a lower carbon economy, and technology and innovation. 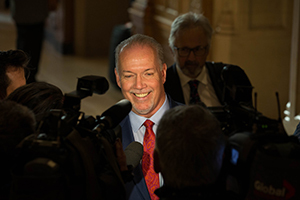 1 John Horgan, Premier of British Columbia, did not attend the 2017 Summer Meeting of Canada’s Premiers.